Buell was born in Clinton, Connecticut, in 1743. He was apprenticed to a silversmith and later practiced that trade with some success. At an early age, however, he got in trouble with the law, using his engraving skills to counterfeit the colonial currency. Because of his youth, he got off with what was considered a light sentence in those days: he had one ear cropped and he was branded on the forehead. Buell moved to New Haven, where he began experimenting with the founding of printing types and the minting of coins, this time legally. He also began engraving copper plates for printing. Among his early engravings are a chart of Saybrook Bar at the entrance to the Connecticut River and a diploma for Yale College. It was there, in 1784, that he published his New and Correct Map of the United States, the first map of the new United States to be printed and published in America and one of the first to show the flag of the new nation. Like most of Buell’s other ventures, his New and Correct Map was not a financial success. Buell died in a New Haven almshouse in 1822. The Connecticut Historical Society has one of only seven surviving copies of his groundbreaking map, as well as other examples of his engraving. 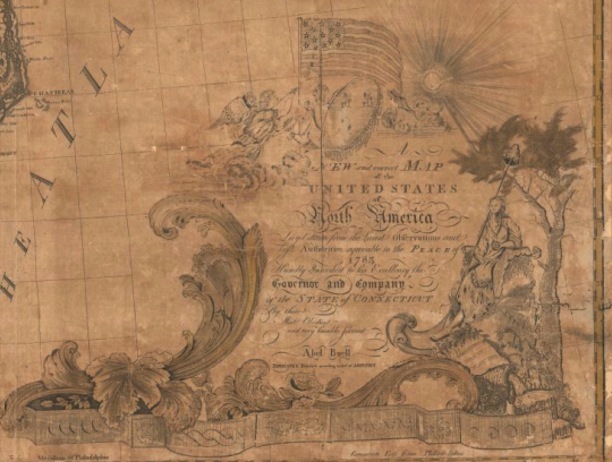 The Connecticut Historical Society received a major grant from Connecticut Humanities to organize, catalog, and digitize about 800 maps from the CHS collection. These maps will be added to eMuseum, the CHS online museum catalog, and to Connecticut History Illustrated, a collaborative online digital library of primary and secondary resources relating to Connecticut History. Nancy Finlay, formerly the Curator of Graphics at the Connecticut Historical Society, is the editor of Picturing Victorian America: Prints by the Kellogg Brothers of Hartford, Connecticut, 1830-1880. “Connecticut Historical Society,” 2017. Link. Buell, Abel. “Abel Buell, of Killingworth in Connecticut, Jeweller and Lapidary, Begs Leave to Aequaint the Public, and the Printers of the Several Colonies, That He Hath Discovered the Art, and Hath Alreday Entred Upon the Business of Founding Types...” Edes & Gill, May 1769. General Collection, Beinecke Rare Book and Manuscript Library, Yale University. Link. Buell, Abel. “The Sequel of Arts and Sciences. Hand-Colored Engraving.,” 1793. Connecticut Historical Society. Link. Wroth, Lawrence C. Abel Buell of Connecticut, Silversmith, Typefounder & Engraver. Middletown, CT: Wesleyan University Press, 1958. Schoeffler, Nancy. “Counterfeiter Abel Buell Later Forged an Inventive Career.” Hartford Courant. April 3, 2014, sec. Moments In History | Courant 250. Link.